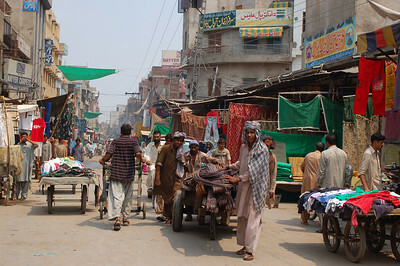 Lahore is a huge, busy, modern city and when we were there it was also really hot. We decided we would stay only two nights, so we packed our days in an attempt to experience the most of the city. 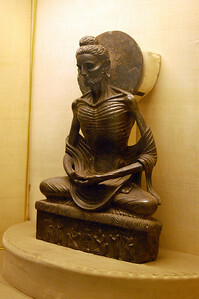 Our first stop was the Lahore Museum, which I only wanted to visit because of its "fasting Buddha" statue. It didn't disappoint, it sure was a skinny Buddha. I also enjoyed the moustached Buddha sculptures, up until Pakistan he was usually fat and baby-faced. There was a substantial police presence (armed) on the streets as some opposition party marches were planned around the city, we didn't see much action but were stuck in the re-routed traffic. Back at our hostel we met up with Daniel, who we had crossed the border with. It was his second trip to Lahore and he had promised to take us to the second-hand market where we could pick up some Pakistani dress. Most men are clad in the traditional shalwar kameez, a long shirt and trousers of the same colour (usually a neutral off-white, beige or light blue). Women wear a similar outfit but usually more colourful and ornate with a matching shawl to cover both the head and chest. The second-hand market is an amazing place, with recycled goods everywhere, of course I didn't know this until AFTER I bought the men's underwear for pyjamas. For his outfit, Yann had every possible shade of off-white to choose from and settled with a beige. The women's clothing selection seemed to have an 80's feel to it and I had trouble finding something that wasn't hideous, I chose a long plain pyjama/tent that was hideous but at least wasn't a fashion faux-pas. We got back to the hotel, changed into our new outfits and hung around swapping information and recommendations with other travellers. The "Regale Internet Inn" was another welcome change from India (and most of South East Asia). Mostly dorm beds, not very luxurious but a completely hassle-free environment. Internet on an honour system, complimentary filtered water, free use of huge refrigerator and kitchen. Adding to its popularity are the Thursday "Sufi Nights" that include an afternoon of qiwwali (Islamic devotional singing, which we missed due to our shopping) and a night of Sufi (Islamic mysticism) dancing and drumming. A guide from the hotel accompanies all the tourists, including many women who normally wouldn't be found at these male dominated venues, free of charge. We didn't leave for the Sufi venue until well after dark, a row of rickshaws awaited us outside the hotel, pre-arranged for the tourists. We loaded in and drove off to the shrine of Baba Shah Jamal in the outskirts of town. We raced a donkey cart loaded with locals on the last stretch of the trip and arrived to a place overflowing with activity. 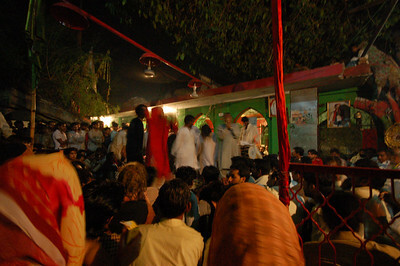 People line the small dark alley selling drinks and snacks to the local men pouring in and out of the shrine. Rickshaws arrive by the dozen. Our guide quickly hurried us up the long flight of stairs to the upper outdoor quadrangle where the expert Sufi drummers play every week. The tourists are given a prime spot, with all women shoved to one side. But a prime spot in this ridiculously crowded place still involves a certain degree of pain and sweating. There are people everywhere, and when I say people what I really mean is men. Just when you think its impossible to cram anyone else onto the floor another crowd of people comes up the stairs, push their way through the crowd, exchange a few words and manage to sit themselves on top of people until the crowd gives and they find themselves a seat. The locals exercised a lot of restraint when it came to the tourists, never being too harsh with us as we were jostled around, but a poor Canadian-Pakistani (first time in Pakistan) was mistakenly thrown into the main seating area and was shown no mercy, he was seated right in front of me but by the end of the night I couldn't even see him. When we arrived the "warm-up band" was on, two men with absolutely beautiful voices devotional chanting while collecting donations. As they sang, vendors made the perilous journey back and forth through the crowd selling juice or snacks. Others spray rose-water from backpacks/tanks rigged with a hose, or cool us down with large bamboo fans, for these services they get small donations. My donation to rose water man got me a large blast to the face, thank you. As with all warm-up bands, the crowd was getting impatient and finally the two famous drumming brothers appeared and began beating away for the happy crowd. Actually it was a very happy crowd, the smell of hash permeating the outdoor theatre and the haze of smoke getting increasingly thick. It was being puffed away at an alarming speed with five joints lit and smoked at once (by one person at a time). One of the two brothers was born deaf and his father apparently taught him how to keep a beat by drumming on his back. With years of experience he keeps synchronised with his brother by feeling vibrations through his abdomen. Members of the crowd began their week's journey towards enlightenment by spinning their heads vigourously in beat with the drums. The drumming went on for a long time and we were so sweaty that our hands and feet had wrinkled up like we had come just come out of a bathtub. By now it was close to midnight and I was getting grumpy because Yann didn't want to leave when two other girls that I was sitting with got up to leave. But for once, Yann made the right decision, what I didn't know was that the headlining act hadn't even come out yet. The drumming stopped and the "bouncers" frenetically cleared a large area around the two drummers (squeezing people into an even smaller space). 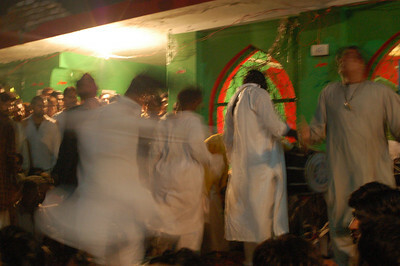 The drumming quickly started up again and the dancers entered the shrine. The dancing began to the cheering and chanting of the crowd. First some general arm waving and stomping around to the beat of the drums. Then full out head shaking, body spinning action. Most of the dancers were quite young and spun around with absolute determination and physical superiority. The oldest of the group was gigantic, stood in one spot the entire time (well over an hour) but shook his head back an forth at a concussion-inducing speed without ever taking a break. The longer and faster a dancer would spin, the rowdier the crowd would get. We were hot, we were sweaty, we were squished, we were exhausted, but we were mesmerized. We left when the girl next to me couldn't stand the discomfort of our seats anymore, I was happy I wasn't the first to indicate my desire to leave, I was torn between the amazing spectacle before us and the unbelievable pain in my back and the pile of my own sweat that I was soaking in. We got back to the hotel past 2 a.m.
Lahore, what a cool city! amazing stuff. love to be there. Sounds like Pakistan strikes a chord with both of u.But it ain't no Bluesfest.